Japanese Prime Minister Shinzo Abe visited Sri Lanka and Bangladesh with economics and security in mind. Japanese Prime Minister Shinzo Abe can’t seem to get enough of South Asia. After hosting Indian Prime Minister Narendra Modi for a five-day visit in Tokyo, he set out to visit India’s neighbors Bangladesh and Sri Lanka last week. Abe’s visit to these countries comes at a time when both countries have deepened their cooperation with China. With his visit, Abe emphasizes Tokyo’s interest in retaining influence in South Asia. Abe’s visits to Dhaka and Colombo are primarily meant to foster greater economic cooperation between them and Japan. Abe made no attempt to hide this: he brought “50 top Japanese corporate executives,” involved in industries ranging from transportation to finance to construction, along with him. Abe described Sri Lanka and Bangladesh as “countries with a growing influence in economic and political domains.” He further added that he hoped “to introduce the dynamism of both countries to Japan’s economy by strengthening relations with them and engaging in top-level sales activities.” Overall, Abe emphasized the economic aspects of his visit. Abe’s trip to Bangladesh followed on the heels of Bangladeshi Prime Minister Sheikh Hasina’s visit to Tokyo earlier this year in May. Abe is the first Japanese prime minister to visit Bangladesh in 14 years–Yoshiro Mori visited the country in 2000. Bangladesh has been trying to woo Japanese investment and made no secret of its intentions during Abe’s visit. As Bangladesh’s Foreign Minister A.H. Mahmood Ali noted point blank: “This time what we want is investment.” He continued to describe Abe’s visit to Bangladesh as a “milestone” in relations between the two countries. During Hasina’s visit to Japan earlier this year, the Abe government announced $6 billion in aid for Bangladesh. Additionally, a 120 million yen ($1.1 million) deal between the two countries was announced earlier this summer to set up a coal-fired power plant in Bangladesh. Both China and South Korea have historically outpaced Japan in terms of their investment in Bangladesh. Ahead of Abe’s trip, analysts pondered a possible point of dispute between Japan and Bangladesh as both countries would be vying for a non-permanent seat on the U.N. Security Council for the 2015-2016 term. However, Hasina, following her meeting with Abe, announced that Bangladesh would withdraw its bid for a non-permanent seat, and support Japan’s candidacy instead. Abe and Hasina also agreed to set up a vice foreign ministerial meeting between their governments early next year to fast-track closer relations between their two countries. Finally, according to Japan Times, Hasina was receptive to the Abe government’s recent resolution reinterpreting Japan’s constitutional ban on collective self-defense, welcoming a more active Japanese role in Asian security affairs. Relations between Sri Lanka and Japan have been steadily growing. Last year, Sri Lankan President Mahinda Rajapaksa visited Japan and met with Abe and the emperor and empress of Japan. 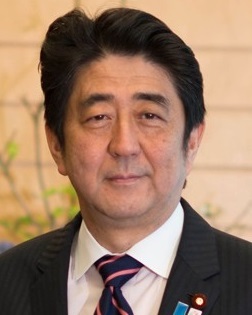 With his visit this year, Abe becomes the first Japanese prime minister to visit the country in 24 years. Economic relations between the two countries remain modest. Only 2.4 percent of Sri Lanka’s exports go to Japan. Sri Lanka is a member of the Bay of Bengal Initiative for Multi-Sectoral Technical and Economic Cooperation (BIMSTEC), a multilateral body comprising Bhutan, India, Nepal, Thailand, and Myanmar. BIMSTEC has been studying the possibility of establishing a free trade agreement with Japan to boost its trade with its member states. Burgeoning bilateral cooperation will likely result in greater trade between Japan and Sri Lanka. Apart from trade matters, Tokyo will finance a new passenger terminal at Colombo’s international airport by means of a $330 million development loan. Meanwhile, China has provided $500 million in funding for a port terminal in Colombo. Japan remains Sri Lanka’s single largest source of foreign development assistance. Abe and Rajapaksa also discussed maritime security. Sri Lanka’s strategic location along Indian Ocean shipping lanes is valuable to Japan. “Our two countries, as maritime nations, recognize the importance of ensuring maritime cooperation and security,” Rajapaksa said after his meeting with Abe. “I am pleased to note the close interaction between the defense establishments of our countries on this aspect,” he added. In June of this year, the chief of staff of the Japan Maritime Self-Defense Force visited Sri Lanka to discuss maritime cooperation. During that visit, the Japanese interlocutor, Admiral Katsutosi Kawano, expressed a desire to “learn from Sri Lanka’s experiences with antiterrorism operations.” Japan may provide patrol boats to Sri Lanka for maritime surveillance purposes. With this trip to South Asia, Abe emphasized that his interest in the region is deeper than just India. While India is Japan’s major strategic partner in the region, Abe recognizes that Japan must develop its relations with Bangladesh and Sri Lanka if it is to compete strategically with China in the region. Both Sri Lanka and Bangladesh remain highly receptive to Japanese overtures–a positive sign for Japan. For Japan to remain a major player in Asia, it will have to remain involved politically and economically, and continue to develop its security ties with countries like Bangladesh and Sri Lanka. Although these countries may not be major regional powers on the order of India or Indonesia, they nonetheless remain relevant for Japanese foreign policy. The focus on China has overshadowed Japan's increasing presence in the region. The long-awaited Kim-Putin summit will finally take place.